Hannah O'Sullivan tees off on the 7th hole during the first round of the JTBC Founders Cup. 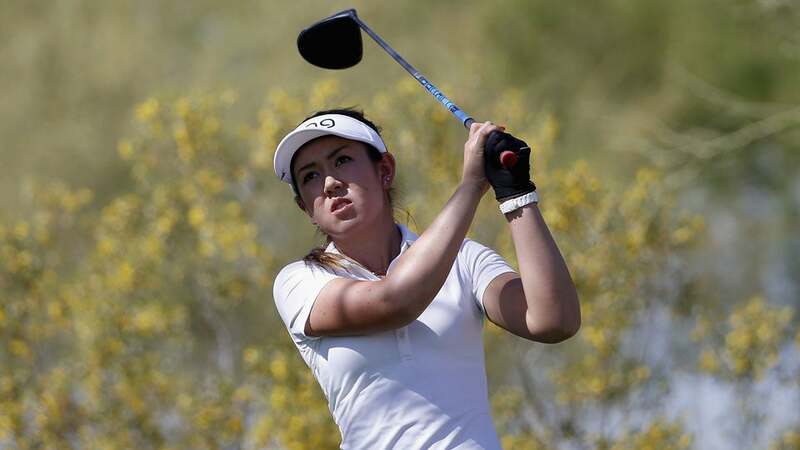 PHOENIX (AP) -- U.S. Women's Amateur champion Hannah O'Sullivan shot an 8-under 64 on Friday to easily make the weekend cut in the LPGA Tour's JTBC Founders Cup. After opening with a 72 on Thursday, the 17-year-old O'Sullivan had the best score in the morning wave Friday at Desert Ridge's Wildfire Golf Club. Playing on a sponsor exemption, the amateur was five strokes out of the lead with half of the field still on the course. "It's awesome, really," O'Sullivan said. "I had the opportunity to play in two LPGA majors last year and I made the cut in both of those. I just take what I can from both of those experiences and apply it to today. I'm very happy and thankful that I was able to do well and make the cut today." O'Sullivan eagled the par-5 15th, her sixth hole of the day. With a slight breeze into her face, she hit a 3-wood from 223 yards to 2 1/2 feet. She birdied the par-4 16th and added five more birdies on her final nine. "I just played pretty clean," O'Sullivan said. "My ball-striking was good. Whenever I missed a couple of shots, I was able to get up-and-down really well. My putting was very good. I kept rolling it well. I was rolling it great yesterday, but the putts were finally dropping today." She's a senior at Hamilton High School in the Phoenix suburb of Chandler, and plans to attend the University of Southern California. "We're on spring break right now," O'Sullivan said. "They're all very supportive, especially my teachers. I even had one of our counselors come out yesterday. ... I love school, but I'd rather be out here for a while." O'Sullivan also is set to play the ANA Inspiration - the first of the LPGA Tour's five major championships - in two weeks in California. Last year, she won a Symetra Tour event in Mesa at 16 to become the youngest winner in the professional tour's history.